In my opinion, Harvey’s Sussex Best Bitter is the finest beer of its style available in the UK right now. Gentle carbonation splutters playfully through its translucent, chestnut brown body – it looks like the pints of bitter I see in my dreams. 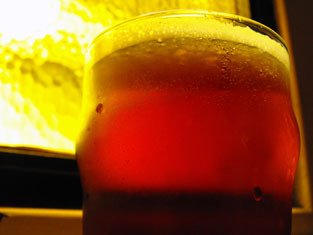 While not the most aromatic of beers, it packs a huge flavour punch that is well above its fighting weight of 4.0% ABV. Fruit loaf-sweetness and earthy, cereal malt characteristics are fused with a subtle, dry, lemongrass-bitterness to create an incredibly complex, deeply satisfying pint of bitter. It’s a go-to beer for me, and one I’ll happily drink over and over again. The Bell is right next to Cannon St Station, in the heart of the City of London. It’s one of the oldest – and smallest – pubs in London, having survived the Great Fire of London in 1666. There’s a list of landlords on the wall that dates back to 1668. 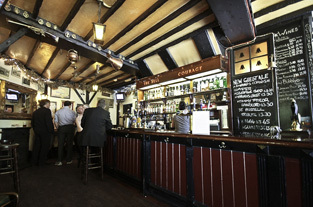 The picture of the cosy single saloon bar above appears with the kind permission of Robert Gale. It captures many things I love about The Bell in a way I never could. Make sure you take a look at it in all its glory. In fact, Robert's Beer Lens and Travels with Beer sites frequently astound me with their perfect expression of the aesthetic beauty of pubs. Sometimes words just aren’t enough. Located right next to a bookies, The Bell seems strangely out of place among the smartly-dressed City workers and towering skyscrapers, almost as if it has been lifted by helicopter from a small town somewhere and dropped in its current location close to the Thames. But it hasn’t – in fact it was here long before the glass and steel behemoths arrived. The range of beers available at The Bell is decent enough without being spectacular, but that’s not why I go there. The Bell is my work local. Alongside some rotating casks, they always have well looked after Harvey’s Sussex Best Bitter on. As you’d expect, it’s busy at lunchtimes and in the evening, but I don’t think I’ve ever waited more than 30 seconds to get served. The staff are friendly, efficient and engaging. The customers are generally older City types, and almost exclusively male. This pub shines out as a beacon of charm, character and comfort in an often heartless, cut-throat financial district that has a tendency to celebrate excess. It’s a hideaway, a bolt-hole, and an escape from the intensity that surrounds it. That it survives against the relentless onslaught of commerce that closes in on it makes this pub even more special – a defiant defender of the old ways against all odds. Drinking a flawless, flavourful pint of English bitter in the perfect London pub takes some beating as a match. The combination of these two things means so much to me that I find it difficult to articulate what is happening in my brain. There’s something at work here that I recognise at an almost subconscious, primal level. A notion that is sometimes forgotten but never truly eradicated from my thinking. A conceptual idea of British pub culture that sends my mind hurtling back through history. There is something about this beer and this pub that makes me feel proud; something that makes me feel euphorically happy and tinged with sadness at the same time. Apologies if that’s all a bit vague, but it’s because the feelings that are evoked are too. As I tune in and out of the clientele’s conversations about their latest business deals, I realise this is the place I would take a visitor to this city who wanted the archetypical London pub experience. I hope they would get it. Cheers for the kind words and the links to the sites. Great post. I hadn't considered this before but some pubs do just match certain beers perfectly. Also, I associate some pubs with certain beers: Kellerbeer in the Old Brewery, Oyster Stout in the Porterhouse. Some places I go to just to get a particular beer.